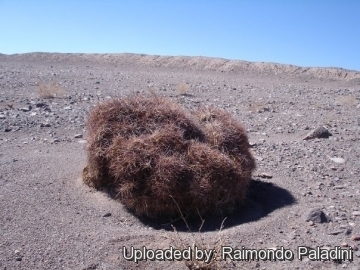 A large clump partly covered by sand in the vicinity of San Pedro de Atacama, North Chile. This cactus never occurs on rocks, but rather on sandy grounds. Altitude: 2000 to 4400 metres above sea level (Medium altitude up to the timber line to extreme altitude well beyond the timber line). 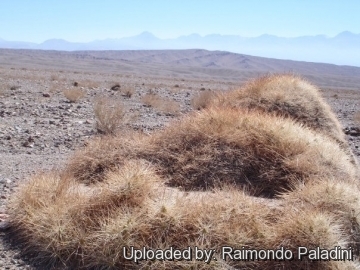 Habitat and Ecology: This species grows in high altitudes close to the line of high Andes in somewhat dry areas where the drought may last 3-5 months. Precipitations 400-800 mm per annum concentrated in winter. 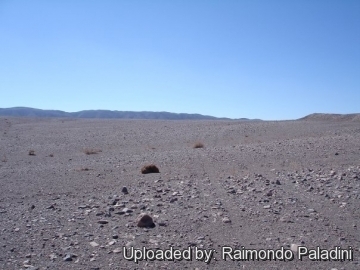 It is present in areas fully exposed to the sun, generally in flat areas or slopes facing north. It never occurs on rocks, but rather on sandy grounds. This cactus does not seem to be affected by any threats. 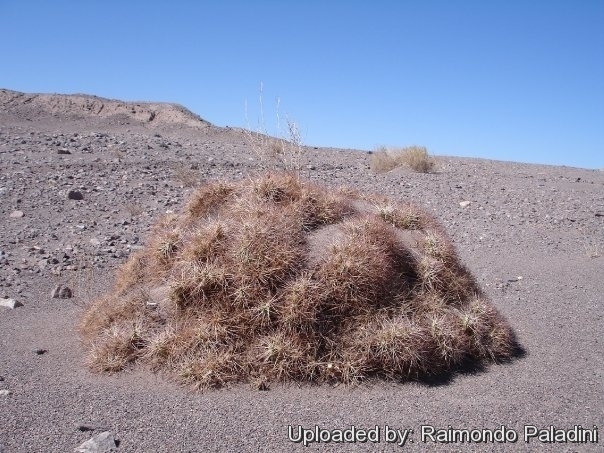 Description: Cumulopuntia boliviana is a cushion-forming cactus densely armed with golden brown spines, native to high elevation deserts around 4000 m in the Andes. It forms large mounds up to 100 cm in diameter. 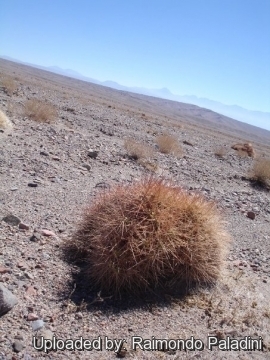 Cumulopuntia boliviana comprises several local or morphological forms that differ slightly in appearance from place to place throughout its range. In cultivation it seem a bit tricky, not developing the dense spines and not usually flowering. Four subspecies are recognized, the typical form (subsp. boliviana), subsp. dactylifera (Vaupel). D.R.Hunt, subsp. echinacea (F.Ritter) D.R.Hunt, subsp. ignescens (Vaupel) D.R.Hunt (Hunt et al. 2006). The complex is often assessed as a single species. Spines: 1 to10 (or more), only on the uppermost areoles near the segment tips, erect or somewhat spreading, straight, rounded or slightly compressed, some thin and flexible, yellow to reddish brown, and sometimes a very few shorter, secondary spines (3-10 mm long) whitish and bristly, all becoming grey and even black with age.